Mopar OEM Chrome Charger Fender Emblem Mopar OEM Chrome Charger Fender Emblem, Dodge Charger Emblem, Dodge Charger Badge, Dodge Charger Fender Emblem, Dodge Charger Fender Badge, Charger Fender Emblem, Charger Fender Badge, Charger Emblem, Charger Badge, Mopar 3504807 Charger Emblem, [Mopar 3504807 Charger Emblem] - $39.95 : 3rd Strike Performance, Your Source for Late Model MOPAR Performance Parts and Accessories! This Mopar Dodge Charger emblem is the same emblem as installed by the factory on '66-'74 Charger models, so this is the perfect way to add some vintage style to your vehicle. They are available for mounting to your grille or your fender. Fender mount emblems include pre-applied, automotive-grade adhesive for easy stick-on application. 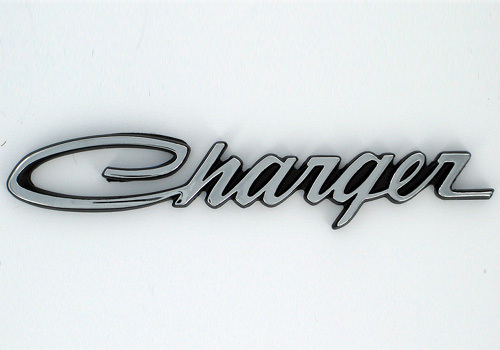 Use this replica Charger emblem from the days of muscle cars to dress up your ride. With hassle-free installation and a great new look, this emblem is a great addition to the fender of any Dodge Charger.